''Sound and predictable policy ... will unleash investment in new technologies,'' said Dow chairman Andrew Liveris. WASHINGTON - As the House Energy and Commerce Committee prepared to pass a landmark climate change bill earlier this month, committee leaders received a glowing letter from an unexpected source: the chairman of Dow Chemical Co., one of the firms that would be forced to limit the amount of pollutants it emits and pay new fees for the privilege of polluting. 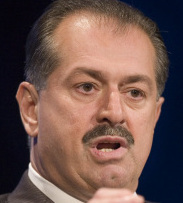 "America is at its best when it leads," gushed Andrew Liveris. "Sound and predictable policy to address climate change will unleash investment in new technologies that will advance both energy security and sustainability." Such accolades are increasingly common from business leaders to Democratic congressional leaders, who are ushering in a new era of regulations on the environment, healthcare, and finance. Confronted by Democratic majorities, a Democratic president, and a voting public furious over Wall Street lapses, the business community, which once adamantly opposed almost all forms of government regulation and mandates, has opted to join rather than fight. "The crass political answer is that you're either at the table, or on the menu," said Peter Molinaro, a spokesman for Dow, explaining why Liveris chose to work with Democratic representatives Edward Markey and Henry Waxman on the climate change bill. But Molinaro also said that by taking a seat at the table, Dow was able to get some satisfaction: The proposed new rules, while costly to the chemical industry as a whole, will also help companies create less waste and be more energy-efficient, he said, saving them money in the long run. "It became natural for us to not just acknowledge the problem [of global warming], but in being part of the solution for it," Molinaro said. "It's for real. It's not just about image." Republicans - who, according to recent campaign finance statistics, have lost their dominance among many major business lobbies - insist that the partnership between Democrats and big corporations will be short-lived, and that business will eventually come back to the party that supports tax cuts and less regulation. And it is unclear if industry leaders will lobby for the major energy, healthcare, and financial legislation as it gets closer to the president's desk. But at this critical developmental stage of bill writing, business leaders are working side-by-side with Democratic lawmakers. In addition to the leaders of major corporations who have been working with Markey and Waxman on the climate change bill, leaders of business groups that fought a healthcare overhaul mightily in the 1990s now meet twice a week with staff members of Senator Edward M. Kennedy of Massachusetts, who is helping to craft a major bill that will probably include new mandates on employers, such as a requirement that large companies contribute to the cost. And the beleaguered financial services industry is supporting efforts by Representative Barney Frank, a Newton Democrat, to draft legislation to regulate hedge funds and other investments. Lawmakers and business leaders say that much has changed with Democrats controlling the White House and Congress. With a 59-40 Senate majority - one that could expand if and when Democrat Al Franken is certified the winner of the disputed Minnesota race - Democrats are better positioned to muster the 60 votes needed to break a GOP filibuster. No longer can industry count on measures to die when they reach the Senate, as they often did when Democrats had to corral a half-dozen Republicans to break filibusters. But with the high cost of employee healthcare, in particular, and an emerging consensus in favor of greater environmental protections, industry leaders also are also softening their positions. "They know certainty is their friend," Markey said, asserting that industry would rather have a uniform national standard than a hodgepodge of state regulations. That was a major reason why automakers agreed to a sweeping deal President Obama announced last week with state officials and environmental groups to increase fuel efficiency standards and lower emissions. "There is a confluence of concern that many business executives have about climate and energy on the one hand, and healthcare on the other, that is making it possible for us to put together these historic coalitions," Markey, a Malden Democrat, said in an interview. "Being inside the tent is always better than throwing rocks." With sharply rising healthcare costs - Starbucks now spends more on healthcare than on coffee beans, and car companies spend more on healthcare than on steel, a Kennedy staff member noted - business leaders are working with Congress on a universal coverage plan, hoping to obtain some relief in the form of cost-containment or government assistance. "I think there's a desperation now on the part of business for government to bail them out when it comes to healthcare costs," said Drew Altman, president of the Henry J. Kaiser Family Foundation, a healthcare policy group. "They've thrown their ideological opposition to government healthcare out the window because they need help with costs." Meanwhile, the healthcare industry, sensing that a national bill may be inevitable, is offering its help. In a letter to Obama, heads of such diverse interests as the American Hospital Association, the pharmaceutical lobby PhRMA, and the Service Employees International Union declared their "unprecedented effort" to help remake healthcare. Even Chip Kahn, president of the Federation of American Hospitals and architect of the "Harry and Louise" TV ads that helped kill the Clinton healthcare plan in the 1990s by raising worries about "government-run" managed care, has been attending the Kennedy negotiating sessions, the Kennedy aide said, speaking on the condition of anonymity because he is not authorized to speak to the media. In financial regulation as well, business is not balking at efforts toward more regulation. The National Federation of Independent Business supported a credit card clamp-down, signed by Obama on Friday that regulates how and to whom companies can offer credit and offers more protection to consumers. Frank said the financial services community is also supporting his efforts to regulate hedge funds, the high-risk, private investment funds now uncontrolled by the government. "Reality has broken through," Frank said, as bankers and mortgage providers acknowledge the demand for stricter rules. But many also believe that regulations will help them, Frank said, by giving consumer and investors more confidence in the markets. Further, legitimate traders do not want to be run out of business by shady competitors, said Frank, chairman of the House Committee on Financial Services. "It's very different from where they were a couple of years ago," he said. The Democratic-business detente bodes poorly for the GOP, at least in the short term. Campaign contributions from the energy, healthcare, and financial service sectors shifted dramatically toward the Democrats from the 2006 election to 2008, according to the nonpartisan Center for Responsive Politics. Representative Tom Price, a Georgia Republican who chairs the Republican Study Committee in the House, wrote off the trend to short-term politics, saying industry would regret it. "It's expedient for [business] to do so," Price said. "This crowd that's in charge is eviscerating the ability of business to function." But Democrats see a fundamental shift in the nation's thinking, one that could bedevil the GOP for many years. "The core conservative argument that government is the problem no longer holds," said Simon Rosenberg, president of the New Democrat Network. "The ideological argument for the Republican Party for the last generation is spent. They're going to have to come up with a new argument."